During the most of December we celebrate the most memorable season of the year in Orlando and the Theme Parks, which is now is approaching and you should hurry up to book your vacation packages or buying at discounted price your Disney, Universal, Seawolrd and any other theme park tickets. Prices like in every place in the world raise up when there are high demand for product or services, so it is important be aware an act prontly while the good location for an affordable price still available at Kissimmee, Lake Buena Vista, Champions Gate, International Drive and Central Florida in general. With huge updates and renovations from the Theme Parks companies you for sure will have something new to ride, to see or experience at the most relevant parks. Orlando Discount Tickets USA give a brief inside what you should miss on your oncoming holiday vacation in Orlando Florida. Who didn’t attend during summer, fall or any other time during the year should pass by Seaworld and enjoy Mako the hyper Coaster . At Disney Epcot beside the Candelight Processions is The New Frozen Ride. Skull Island:The leyend of the King at Universal Studios, Pandora the Land of Avatar which is one of the biggest acomplishement of Disney Animal Kingdom., and Pandora: The Land of Avatar with 2 great rides Flight of the Passage and Navu River Journey and a complete land to explore are probably the most exciting new attraction that will be add to the Theme parks offer. A lot of excitement on the new attractions and also nostalgia due to the attractions the funs love and that are not able to the public anymore. For example Magic Kingdom won’t have the Electrical Light Parade, and the Dragons Roller Coster at Universal Studios won’t be available as well. Orlando Discount Tickets USA expert on disocunts for the Theme Parks and to provide information about the Theme parks in Orlando make very easy to get admission to these dremed attraction for a really disocunted price by participating on a resort preview one of the days you are in Orlando. Tickets or admissions for the Theme Parks can be purchase for prices starting at $25 dollars for Seawolrd, $29 dollars for Universal Studios and $39 dollars for Walt Disney Wolrd Resort. Visit www.orlandodisocuntticketsusa.com to star planning what discounts you qualify and how to make the most of ou time at the Orlando Theme Parks in Orlando. People traveling to Orlando is always looking for deal to take the most of their vacation. In most of the cases the ticket discounts compromises something from usa and the relation between cost and time play a strong role on this decision. For the visitor looking for stay more that 7 days compromise some time to get discount doesn’t represent much and we definiyely invite them to do not over think about getting a discount tourght our promotions. We suggets that for those traveling between 4 and 3 day explore a little bit their plans and if save is a must just take advantage of our vacation packages promotions that include discount of tickets, discount on the hotel rate and the discounts for receiving a breakfats or lunch for your family gruop up to five people. The promotion are usually trought a timeshare presentation and ghere some usefull question on the process of deciding your participation. Can single men buy Timeshare? This is a good question, of course that a single man can buy timeshare when he wants, but many hotels do not extend their promotions to single men due to bad past experiences. Nobody is excluded from doing a tour or from buying, it is the gift or the price being offered that is not available to single men. If you have any questions regarding this, we recommend that you call the Resort directly. Is there any other obligation besides doing the tour? No, there is no other obligation besides attending the presentation. We only ask that when you do the tour to attend with an open-mind, after all the decision of how your family will spend their vacation in the future is completely yours. Can I attend the presentation on the day of my check in or check out? No, the presentations are not offered the days you check in or check out. What happens if I don’t go to the presentation? You would have to pay the penalty plus the regular cost for all the nights that you will be staying and whatever incentive you have received. How many times do I have to attend the presentation? Only once during your Orlando Vacation. At what times are the Previews? It depends on the Resort, but generally previews are offered three times every morning and normally at 8:00 am, 10:30 am and 12:30 pm, seven days a week. Can I take my children to the presentation? Preferably you should make arrangements for the kids before you attend the presentation, however the resorts offer daycare for children between the ages of 3 to 12 years old, and the daycare is usually located in the same building where the presentation takes place. Can I attend the presentation without my spouse? No, married or co-habitating couples must attend the presentation together. How long is the timeshare tour? The presentation lasts an average of 90 minutes to 2 hours, depending on the level of your interest. Visit www.orlandodiscounticketsusa.com to explore multiple options on vacation packages or ticket promotion for the Theme Park in Orlando. Making your trip to Orlando easy, simple and inexpensive. Coming to Orlando in 2017 has to be a pleasant adventure, a time for you to relax and give to your family magical memories at the Theme Parks of Orlando that with a great offers of Theme Park like Magic Kingdom, Hollywood Studios, Epcot, Animal Kingdom, Universal Studios, Island of Adventure and Seawolrd. Because the combination on vacation packages has pretty much unlimited combination in terms of day and assistance to the Theme Parks is highly suggested make affordable and with a wise use of time and resources. 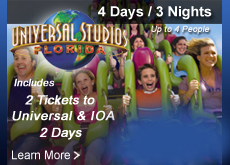 Orlando Discount Tickets USA reminds to you’re the areas to be covered in order to set up your vacations. Google Orlando Central areaso you explore the area you want to expend the vacation. Popular areas are Lake Buena Vista, Kissimmee, Davenport, International Dr, Sand Lake Rd, Clermont, etc. At International Drive with Universal Studios Theme Parks and also Seaworld and the Lake Buena Vista Area where the Disney Theme Parks Magic Kingdom, Epcot, Animal Kingdom and Hollywood Studios are located and that are surrounded by Kissimmee, Clermont, Davenport, Celebration area, etc. Choose the number of days that you will be in Orlando with a general draft of the available options, for example: Theme Parkdays takeas and entire day, outdoor attraction that take half days like water parks, shopping and outlets stores and intermedia activities like airboats, night entertainment like dinner shows, shopping etc. Atending a resort preview during your stay is the primary option to save. This event only takes 90/120 minutes of you day I it can represent savings that start at $160 dollars and much more depending on your package and if you choose to book hotel plus the tickets it will be possible to save even more. The more day you add on your days at the Theme Parks you add the less will be the average price you pay per day. Travel time might represent a different cost of traveling during the low season will put some bucks on your pockets because you won’t have to pay the extra the peak season rates that are usually presents during Spring Break, Summer Time and the Holiday Season. 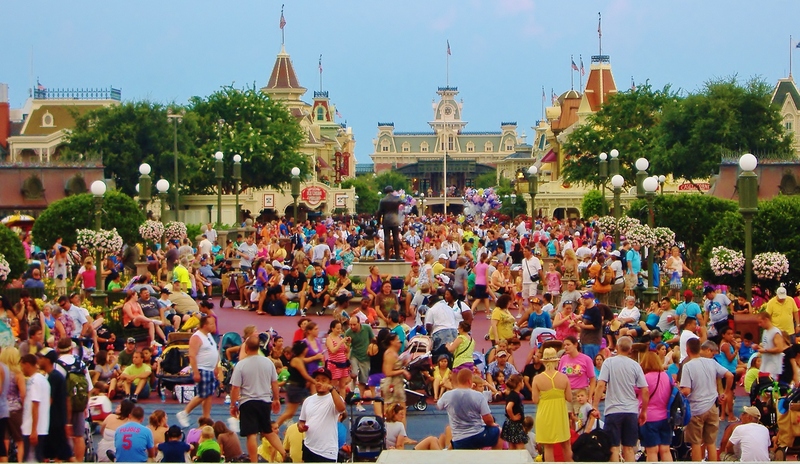 Visitors for first time do not overbuy days at the theme parks specially if you are traveling with little kids, a theme park in general take at least one day and theme parks like Magic Kingdomwill probably require a 2 day admission. Explore different vacation packages available at the market and call them to make sure there are a legitimate company on the hospitality industry. When visiting Orlando for your dream vacations or getaway is very popular to find that people is wondering to do when staying for more than 5 days want to do something diferent to spend the entire day in a Theme Park because even the memories are awesome you at the end of the day fell exhausted. Other case is that visitors coming to Orlando have resort commitments that takes the morning and wishing to do something in the rest of the day they feel lost with what to do, and other situation very popular also is the day of check or check out at the hotels in Orlando, where check in is a 4:00 pm and check out is 11:00am. Buena Vista Water Sport: It is a recreational water sprt facility located en Lake Buena, on a natural spring fed lake. AT this facility visitors will find Sea Doo rentals, waterski and wave board lessons, stand up paddle boards, kayaks and pontoon boat rentals. Orlando Ballon Rides: This is definitely a romantic and at least one in a life time experience. It a experience that takes total abuot 3 hours fo your time counting the time you drive to the place they start inflating the ballon, the ascens, flying above the clouds. During the ballon rides you will be filled with variant breathtaking sights of Orlando, and the pilot will explain about natural preserve of Orlando area, beautiful resort etc. At the landing usually a traditional champagne is offer to celebrate the adventure. NBA Game Live: Even this event is just seasonal it is also one of the exckusive experience that Orlando Florida has to offer as a city. The team for Orlando is the Magic but you can expect any game that runs during your visit. The event are about 6:00pm and it is totally a blast. Even is possible that classic for the NBA will be available and the prices are high you can get a promenade sit and still enjoy de show. Orlando Discount USA has for you assistance on vacation packages a discounted price, starting on $169 for 4 days and 3 night and admission for 1 day at the theme park for the fist 2 adults. Visit www.orlandodisocuntticketsusa.com to discover exciting offers for your next dream vacations. Expectations to visit Orlando Florida, the most magical place on earth can be very high when you listen from friends or coworkers about the unforgettable memories they got, or how difficult it was the experience specially when visiting Orlando first time. The first probably is to clarify is how realistic based on a budget and time can be the plan for your vacation. Orlando has about 8 theme parks represented on 4 companies; Magic Kingdom, Hollywood Studios, Epcot and Animal Kingdom belonging to Walt Disney World Resort; Universal Studios that includes Island of Adventure and Universal Studios; Seaworld’s company that has Seaworld and Busch Gardens in Tampa and Merlin Entertainment that operates Legoland. As important information is to know that admission for a day is about $100 dollars and of course the more days you buy with a company more chances you have to pay on the average price per day. Orlando Discount Tickets USA recommend not to cover every single day with a visit to the theme parks and if you are traveling by airplane do not include a visit to the theme parks the day of your checking o day of your check out specially if you are getting a vacation at discounted price. Orlando Florida has multiple offers on accommodation and tickets with discounted prices, and basically you get the offers by always participation on some kind of meeting o informative visit to a resort. That is the true about getting a great discount, and is nothing wrong or hard on that because this way you can save on tickets and hotel and by you participating on the discounted offers there is not financial obligation, just attend with an open mind. Book you discounted vacation for Orlando Florida ahead on time, and confirm with the company prior to the date of your trip so make sure everything is in order, by you doing this you guaranty you have all the information of hotel, time and information of your resort preview (the way you get discount) and tickets that will be included to you. Even is not impossible book you trips with few days before it might happen that resort have availability for the day you book the tour but at the moment that it is created the spot are taken by other costumers and the preview will be schedule for the next time available, without you having enough time of change for a different date and creating some discomfort or unsatisfactory experience in the way you planned your time. With Orlando Discount Tickets USA you can get packages as cheap as $129 dollars for a 3 days and 2 nights with admission for 2 adults for 1 day admission at one of the theme parks. 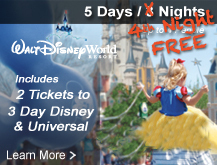 Visit www.orlandodiscountticketsusa.com to discovery discount on just admission for the theme parks for Universal Studios, Disney, Seaworld or discounted vacation packages with multiday admission between the theme parks. Florida offers for the international tourists more that 8 theme parks, 4 water parks and a conglomerated of optional theme attractions to satisfy the leisure and touristic industry. Because options are for all types we give you a list of considerations before purchase your vacation package to Orlando Florida. Orlando Florida knows how to give you memories of a life time by customizing your vacation. Length of stay: determine how many parks you will be able to visit and how to combine with other optional awesome things to do in Orlando. The length of stay vacation package is usually defined for 3 options: Short Orlando Getaway Vacation with 3-4 days and visit for one park, under this criteria statistics show that people traveling to Orlando usually choose as their park of preference Magic Kingdom or Universal Studios. ; the second option is almost a week between 5 and 7 days and people usually visit at least 3 parks, under this premise the most popular parks are Walt Disney for 1 day, Universal Studios Orlando 1 day and Sea World Orlando for 1 day and finally the longest length of stay for more than a week gives you free options to visit as much parks your time and budget allow it. The composition of your family group: If you are traveling us a couple pretty much you can enjoy day and night time in combination with your length of stay and budget. If you are traveling with babies or small kids you might want to have a day to enjoy the resort or slow down a little bit so kids and you have all the energy to every day take the most on your theme park visit. If you are traveling with seniors keep p in mind that they will have to pay full admission even if they do not ride anything at the parks, they will have to walk a lot for what is convenient to rent a wheel chair or electric scooter. Our experts on www.orlandodiscountticketsusa.com.com will tell you base on the members of your group which theme parks are better for your family. Accommodation: The most promoted accommodation in Orlando is time share discounts or vacation clubs. However the options are pretty much a hotel room where sleep up to 4 people on 2 double beds,; villas of 2or 3 bedroom that comfortable accommodate up to 8 people and that comes equipped with kitchen and dining room and the third most popular option is rent a house through a property management company, this last option is great for big families you will find houses with up to 7 bedrooms. Prices on theme parks per person: The admission of the theme parks in general is over a $100.00 dollars per person. Adult price is for people 10 years old and over and child price is for children between 3 -9 years. It looks expensive but there are always ways to save on your tickets with www.orlandodiscountticketsusa.com .With the park admission all the rides, shows and attractions are include, the only thing is not include is the food and parking. Hide Expenses: In the preparation of your vacation keep in mind the expenses that the most of the people don’t realize unit they get to Orlando: Parking at the theme parks $17, Taxes and Resort Fee from $3.50 to $25, food at the parks which is 30% – 35% more expensive that eating outside. Believe me Magic Kingdom as the Park for excellence in Orlando is a lot of busy the most of the year, off course people from all the races, languages, backgrounds and more recondite places on earth take the opportunity to visit in the place where dreams come true. Just a few examples of how busy it gets, on the week of Christmas and New Year Eve the Magic Kingdom close its door to the general public because has been reached the maximum capacity of occupancy allowed, On the last week of Christmas the park was closed by 9:45 am. Orlando Discount Tickets USA helping you prepare your next vacation to the Theme Parks in Orlando give very useful tips to save you time when visiting the theme parks concern. Buy you multi day theme park tickets with Orlando Discount Tickets USA Online trough our resort preview to get discounted prices or buy your tickets online having the guarantee that they will be delivery to your hotel. Getting an online confirmation of Disney tickets purchased online require that you visit the will call office at the parks and on the busy time that might take up to 40 minutes of your time. If you have flexibility to visit the parks any time of the year and you are not attached to any special edition event, schedule your vacation for the lower traffic seasons at the parks. Place your hotel accommodation in a hotel or resort close by and inquire if hotel offer shuttle to the theme parks. In case you have brought your own car you will be charge $17 dollar flat rate per day. Even you have to spend a little more if decide to take your vehicle is worthy especially if you are visiting Magic Kingdom because you have the flexibility of leave park when you want and you don’t have to be attached to the schedule published by the shuttle company at your hotel. Once you are at the park if you have take a look at the maps and time guide, please sit for 10 to 15 minutes to prioritize attractions, get information about the shows times, and appearances of the characters. Arrive early to the shows times to get a better view, take this time as a opportunity to recharge your batteries. Have a plan in case any member of your party gets lost, select a place and time to met. Even Theme Parks have a great variety of restaurants; bring snack for children and enough water to be hydrated. Snacks oscillate around $5 dollar each and you will be paying for a bottle of water $3. Check if attractions that you couldn’t visit during the day are open at night and go take a ride, usually is less busy. Bring your camera or cell phone to record the most magical moment. As the Disney Parks all of them offer free WiFi.